So Zeitgeisters, I finally got some time to catch up with a number of shows that have been consuming memory on my Korean Teevo. Here are my reviews. Despite its naff title this Channel 9 drama turned out to be surprisingly good. This is no slight on the 9 Network who have done some excellent work in 2012 with THE GREAT PERTH MINT SWINDLE and BEACONSFIELD. I know I’m not the only person who thought a miniseries about the late media tycoon and former Channel 9 owner, changing the face of modern cricket, might not be gripping drama. Perhaps I should have had a little more faith. The show was made by the folk who brought us the excellent PAPER GIANTS (with Asher Keddie and Rob Carlton) the drama about the creation of Cleo magazine, so they had the advantage of examining Packer once before. HOWZAT! offers a different take on Kerry Packer (Lachy Hulme). Hulme looks less like the real article than Carlton did, but he brings more physical presence to the role. 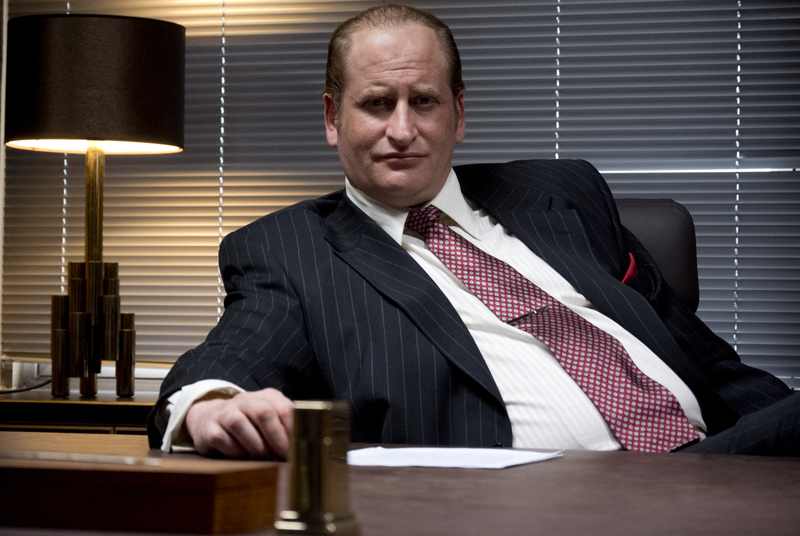 Hulme had only just finished losing the weight he gained to play Todd Russell in BEACONSFIELD when he was asked to play the bulky media mogul. The scriptwriter for HOWZAT and PAPER GIANTS is Christopher Lee and he works his magic for a second time. It’s difficult to portray iconic media characters and to capture the spirit of an era, but Lee clearly has a knack. Given that Packer’s “war” was really about enabling him to buy the Australian television broadcast rights to the cricket from a reluctant Australian Cricket Board, then this production does a genius job of getting us on his side. This is achieved by making the story more about international players being paid their due for their skills. There is no doubt that in the early 1970s cricketers were getting pitiful money. The marketing and broadcasting of the sport was still very old school. Therefore Lee’s screenplay feels less about a very rich man getting what he wants and more about a group of rogues flouting tradition and putting one up The Establishment – and what Australian doesn’t enjoy that? The casting is mostly good, but with such a large number of characters to get through most of the actors only have a few lines and a couple of moments to lodge themselves in your mind. HOWZAT’s Max Walker, Dennis Lillee and Delvene Delaney don’t look too much like the originals. And the series’ idea of Doug Walters is way off. Even in the 1970s he looked like a throwback to the era of Bluey and Curley or perhaps even Dad and Dave. Faux-Walters had a cigarette going in every scene, which may have been accurate, but it also made him look like the only serious smoker in the country. On the other hand, although Damon Gameau had to wear dark contact lenses to play Greg Chappell he looked eerily Chapellesque as a result. Despite the clever sleight of hand in the writing, the real story is Kerry Packer’s and John Cornell’s. Cornell was the businessman whose ideas of an exhibition test with cricketing stars, sparked Packer’s concept of a world series of cricket. Cornell was better known to the public as the dim character of “Strop” from the Paul Hogan show. Interestingly, Abe Forsythe plays Cornell without his usual recourse to comedy and he does a fine job. Hulme is very good indeed playing a demanding character. Perhaps the best thing about the mini-series is it doesn’t stint in showing us the bullying part of Packer’s personality. Canadian filmmakers Sam Dunn and Scot McFayden’s 11 part VH1 series was released in 2011 and it documents the birth, development and evolution of all the music that has been labelled Heavy Metal. Dunn is the front man for this enterprise and we literally follow him around on aeroplanes and in taxis as he criss-crosses North America and Europe following the history of the music he loves. He speaks with members of various bands such as Black Sabbath, Deep Purple, Slayer, Judas Priest, Van Halen, Def Leppard, The Stooges, ZZ Top, Soundgarden, Mötley Crüe, Poison, Alice in Chains and Lamb of God and to luminaries like Lars Ulrich, Dave Mustaine, Ted Nugent, Tom Morello, Bruce Dickinson, and Jonathan Davis. Each episode deals with a branch of the Heavy Metal Family Tree. Just to give you an idea of the kind of detail on offer, the first four episodes are Pre-Metal, Early Metal Part 1 – US Division, Early Metal Part 2 – UK Division and New Wave of British Heavy Metal. Dunn is neither an amazing interviewer nor an elegant narrator, but he is passionate about Metal and honest about the bits he doesn’t like or understand. In the introduction to the Nu Metal episode, he admits he hated many of the bands that came under that heading. Although a series like this does, by necessity, skate over the top of some of the history and goes into a too much detail about other aspects (Limp Bizkit at Woodstock ’99 for example), it is a solid attempt to explain and celebrate a disparate and sometimes maligned musical genre. RAKE, the ABC series starring Richard Roxburgh as Cleaver Greene, a hedonistic criminal lawyer, is in its second season. The first season was patchy at times, but showed promise. The British seem to do this sort of thing well, but for some reason, Australian attempts at giving an established acting talent their own quality cop, doc or lawyer series often seem to fall flat (HALIFAX FP anyone?). But not this time. The show is pitched somewhere between RUMPOLE OF THE BAILEY and CALIFORNICATION. Series’ creators Roxburgh, Peter Duncan and Charles Waterstreet have given us a memorably flawed character. Greene has a high opinion of himself despite overwhelming evidence that he has stuffed up his life professionally and personally. He continually underestimates his opponents and bites off more than he can chew. He is a poor loser and is not dignified in victory. He is not your everyday Aussie battler. He is not a humble, good bloke who knows his place. Cleaver Greene is the anti-Rafter. One and a bit seasons into this show and the various story strands involving Greene’s disappointed family and friends and his many messy relationships, have percolated nicely. The audience doesn’t necessarily know which politician, judge, disgruntled ex-client or ex-lover might crash into Greene’s world next and that keeps things from being too predictable. What saves this from becoming as off-putting as CALIFORNICATION is that Greene seems to be making some attempt to better himself. There was a nice moment in last week’s episode where he started out making a quasi-confession to a priest and then it became something different, almost a victory speech, but one he couldn’t fully invest in. It’s that kind of ambiguity that makes this good television. Roxburgh mostly plays Greene for comedy but he is capable of moving the audience when he needs to. The priest was a bit part played by the excellent Tony Barry. Many of the guest roles are played actors that we don’t see on our screens often enough. The second season of LOWDOWN is currently running on ABC on Wednesdays and Thursdays. Created by Adam Zwar and Amanda Brotchie it follows the adventures of an entertainment reporter, the reliably self-centred Alex Burchill. Sadly, this AWGIE award-winning comedy has remained exactly the same in its second season. Despite Zwar’s actual years of experience as a journalist in Melbourne, his show somehow doesn’t persuade as an insider’s look into that world. Yes, it’s a comedy not a documentary, but it needs to be funnier if it isn’t striving for accuracy. At this point, I will admit my no years of being a journalist do not make me the best judge of how well the workplace part of this sitcom operates, so if any journalist does sees this review whilst trolling the world of personal ‘blogs I will be more than happy to hear that LOWDOWN feels exactly right to them. I have enjoyed Zwar’s other work, the original WILFRED television series was funny and AGONY UNCLES was a very smart and entertaining show. Apart from Brotchie and Zwar, LOWDOWN is also written by Trudy Hellier. Andrew Knight is again credited as script editor. LOWDOWN seems to be less about the Melburnian media than a whimsical take on the World of Alex Burchill. The relationships between Burchill and the regular characters–his sometimes girlfriend Rita (Beth Buchannan), his photographer mate Bob (Paul Denny), his editor Howard (Kim Gyngell) and his Doctor, James (Dalian Evans)–all have a slightly off-beat feel to them. Burchill’s attitude seems to be one of slight disbelief as he is beset by these oddballs. Zwar is good at this and in fact all the cast are good in their roles and have funny moments.